The interfollicular epithelium contains three types of cells. 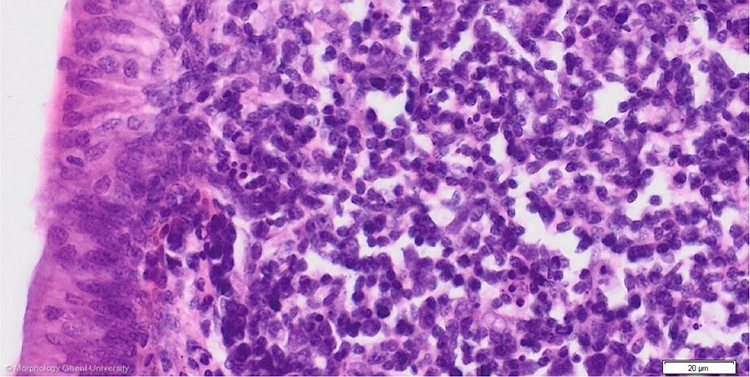 On the micrograph above, the less numerous type I cells can be recognized by their round, paler nuclei. Type II cells are most abundant and are characterized by a darker, elongated nucleus in the lower cell part. A third cell type are narrow goblet cells (not visible above). The cells of the follicular associated epithelium (FAE) include columnar cells with microvilli, scattered secretory dendritic cells and FAE-supporting and â€“ bordering cells. The FAE is considered to play a role in the direct uptake of antigens out of the lumen to bring them in contact with the lymphatic cells in the medulla.